Prochoice Safety Gear introduces a new range of gloves designed to provide a high level of cut resistance. Taeki 5 cut resistant gloves feature a liner made from a composite yarn that delivers superior cut resistance, comfort, breathability and fit for extended periods of use even in wet, dusty or oily conditions. The yarn material does not shed lint, making the glove suitable for use in cleanroom applications. Taeki 5 cut resistant gloves can be dipped in a variety of coatings to enhance specific characteristics. For instance, nitrile dipped palms offer additional abrasion resistance and excellent grip in wet and greasy conditions while polyurethane dipped palms make these gloves especially suitable for handling glass or stainless steel. Latex palms enhance the close-fitting, cut proof characteristics of the Taeki 5 when working in wet environments. 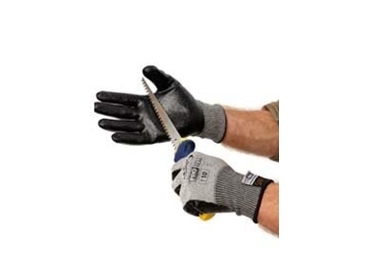 Chrome leather palms increase the robust protection of the gloves when working with cables, hot metal, glass and rough-edged metal fabrication.